All people should have the choice to marry, regardless of sexual orientation. Here’s where I need to confess something to you… I’ve never really been interested in marriage. I remember as a teen, my friends would talk about weddings and bridesmaids and the dress they wanted and the ring they wanted. I’d listen and pretend to be interested, but I never really cared. I’d try to imagine my wedding and I couldn’t really ever see it. I assumed all my friends would be bridesmaids, but that’s all I really could plan. I hoped I’d find someone I could love forever, since I knew I was required to get married so I could have a family… but it seemed like an impossible feat. I was all for being in love and having boyfriends… but I romanticized the idea of being a strong independent woman and dating a lot (Mary Tyler Moore makes a big impression when you are 7.) Even the loves I had never made me want marriage. It’s that FOREVER thing. What if you fall out of love? What if they do? Maybe if I found the right person, my mind would be changed. Maybe. I don’t care about getting married myself, but I’m consumed by marriage equality. 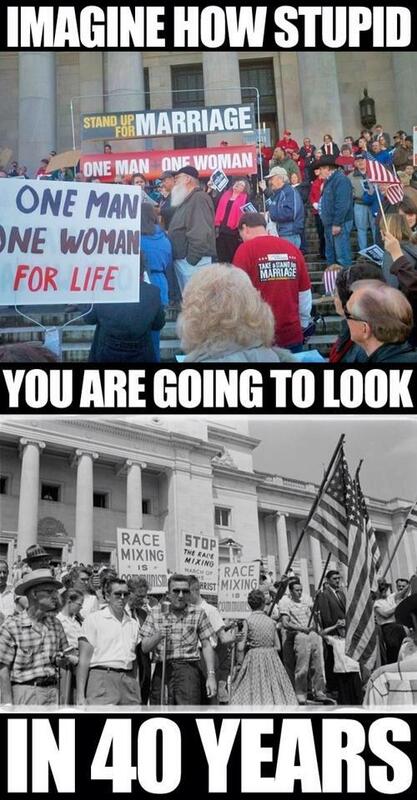 Of course, many homosexuals like many heterosexuals won’t get married, but it’s about having the choice. It’s about what this country claims it stands for – all people being created equal under the law. 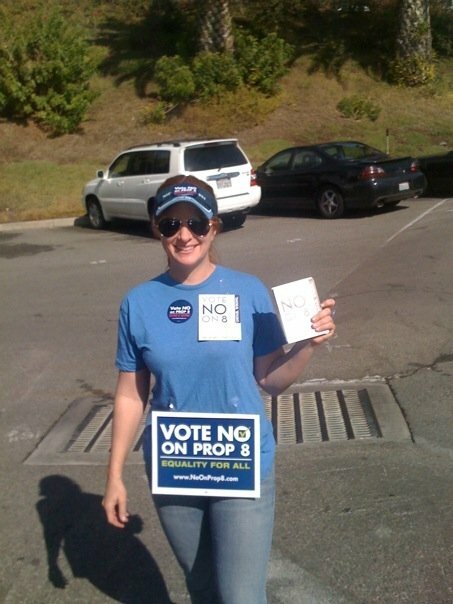 In 2008 I worked for the No on prop 8 campaign. In California, you need to be 100 feet away from the entrance of the polling place, so you are not electioneering. Jose and I spoke with the (very old) volunteers before we began and they offered us cookies and lemonade. “I don’t know why more organizations aren’t out here for their causes,” one of the volunteers said. I was nervous, but I hoped I was in a liberal area. Malibu? Sure, I was going to be preaching to the choir while handing out my flyers. “No on 8 is No on Hate!” I’d call to the voters. It was a simple way to remember. What unfolded in the next few hours was soul crushing. We got a few thumbs ups, but a lot of negative yelling. “You aren’t supposed to be here!” “What you are doing is illegal” were the most common rants. “Actually, it is legal,” we would explain, to those who stuck around to yell at us. “As long as we are 100 feet away from the polling place.” Most of the people didn’t believe us, as we found out later when the volunteers told us how many complaints and requests to call the police they’d gotten. “No on 8 is No on Hate!” I called to a beautiful, fit, tan heterosexual couple. “Yes!” the fake boobed woman smiled and clapped, cheerleader style. OH JESUS! I wanted to scream back yes it does. But I couldn’t speak. I was paralyzed. “We are just trying to remind you that a no vote on 8 is a vote for equality,” Jose said calmly. I was shaking. The bronze god ranted some more non hate about not caring if gays want to be together but marriage is between a man and a woman, while his (I’m sure very well treated) girlfriend, pulled him away. An old man walked by. I wasn’t going to say the hate word again. “No on 8 is a vote for equality,” I sang happily. The old man turned, pointer finger raised. “Are you telling me I should vote for a man to marry a man? Garbage!” He was all worked up. “Married people are supposed to make babies. That’s why marriage exists. Can two men make babies? No!” He was screaming. “And some of these gay men are having babies together! Two women too. There are two men in my neighborhood who are raising a child together; it’s unnatural. It’s disgusting and ruining our country!” He was turning red. “Are you one of those gay men?” he asked Jose. “How about you, huh?” he shot that ancient, accusing pointer in my direction. I trembled. I hate conflict, but mostly I kind of wanted to strangle him. “It’s none of your business and it doesn’t matter what I am. I’m a human being. We both are,” I managed to say, forgetting to breathe. “Blech, horrible. Ruining the world!” The old man spewed and then drove off in his nice Jaguar. I was stunned by Jose’s grace. I was awed by his lack of hurt feelings. He was so young and he was so strong. I tried to absorb his might, but I couldn’t. I was crushed. I was sad. I felt hopeless. 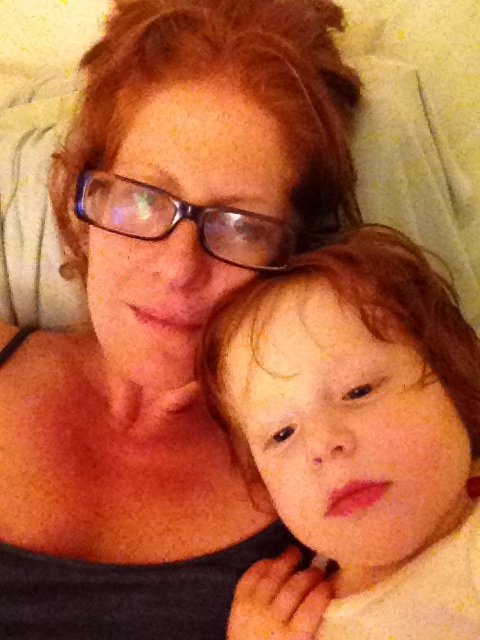 Today, as a mom solo, I know there are a lot of people who look down on the way I’ve chosen to live my life. A child needs to be raised by their mother and father, many say. My circumstance is not as extreme as gay rights. But I think about Jose and I understand him a bit more; I don’t care what others think of me and my life. I know what’s right and I am happy. I’m living my life with grace and not hurting others by my choices. Thinking of you, Jose, wherever you are. This entry was posted in OFF TOPIC, SOLO STUFF, THINGS PEOPLE SAY and tagged marriage equality, mom solo, single mom by choice. Bookmark the permalink. Can’t please all the people all the time but the momentum is changing for equality whether they like it or not. It is coming to a city near you and for that I am happy.